Description: The critter spent most of the time parked behind overhead door.It was always a treat to see it parked outside. Description: There was a pole yard to the right of gate that received gon loads.Across the NWK.BR. from here ties were buried in the ground and it looked as though a siding once existed there.Until 1970s Northern Iron and Steel had an active spur between here and Athenia Station that shipped scrap in gons. Description: Transformers were moved indoors for service.From the transformers appearance leaking cooling oil was a problem. Description: Transformer rolled on and off carriage from this side on rails.My guess is that the transformers were PCB laden and on google view it appears most have been replaced by newer(hermeticaly sealed ?) syle units in background. Description: 3 way switch behind loc connected with NWK. BR. to the right,into the building straight ahead and up the hill to the transformer farm to the left. 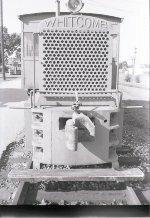 Description: Read in an early 90's Railpace article that it was repowered w/diesel engine.The exhaust was originally at the front of the hood and looked like a steam stack.Note the early saftey glass that appears to have chicken wire inside. Description: Watched riggers offload transformer from a drop flat to a lowboy trailer here along with half the kids in neighborhood.